I quite liked the first season of Arrow, and I am now starting to watch the second. 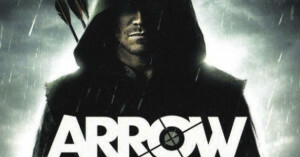 The second season is building on the events of the first, and it is continuing its transition from the standard CW teen romance show in to a full fledged superhero TV show. Though I was disappointed in the first episode. It was very un-Green Arrow like to run away sulk, but once he is back in Starling City (I hope they change that to Star City it was pointless to rename it), he gets back to being the best Batman rip-off around. It is one of my favorite shows on TV, and it gives me high hopes for all of the other DC properties hitting the small screen this October. If they can manage to make a good Justice League on TV, I would be a very happy geek! Previous PostPrevious Transformers 4 Proves That Pandering To Geeks Is Pointless! Next PostNext Shmee Tries To Walk Hard!